We've had a few loose tiles in the bathroom. Apparently we didn't get good adhesive when they were laid. 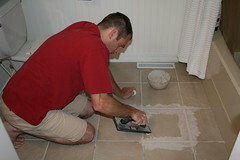 Mickey's been tackling a bunch of home projects lately and the tiles were on his list. He removed the two he knew were loose and then realized that there were about 6 more that were loose too. That was a bit more work than he thought he'd have to do. He took them all up and scraped off the bad adhesive. 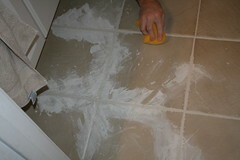 Then he put down the new adhesive. (The people at Factory Tile let him use an open bag and then bring back the rest. For FREE. Can't beat that.) 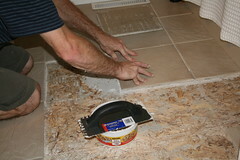 Then he laid the tiles back in place. 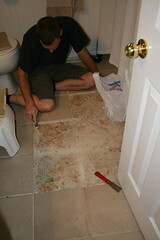 They had to sit for a while and then the next day he swapped out the bag of adhesive for an open bag of grout. (Again, for FREE.) Mickey put that on and then wiped off the excess. We were kind of without a bathroom for a while since we weren't supposed to walk on the tiles. And of course they were right in the middle of the room. Luckily we added that other bathroom last year. (I still haven't blogged about that yet. Maybe after I get something hung on the wall.) 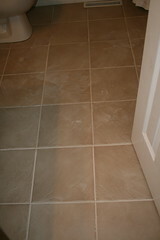 Now the tile job is finished. (It does need to be cleaned a little bit though.) Hooray! I'm so glad I married such a handy guy. Thanks, Sweetie.